1. There are no boundaries. 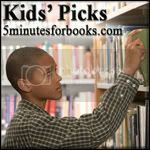 You just get to talk about whatever it is that your kid enjoyed reading recently. Where's Waldo? The Wonder Book . My sister-in-law bought him a mini Waldo book last year for Christmas but at age 1 he didn't really get into that much. I recently pulled it out to see what he would think and he really liked it. I was swapping some books at our local used book store and found a larger Where's Waldo book and decided to pick it up and play with it. My son enjoyed the I Spy books and so I figured we were about ready to tackle Waldo and boy howdy, that's the case! He loves trying to find Waldo. He especially liked finding Waldo on the page before Mommy did. I will not quickly forget his reaction and look of pure joy, knowing that he beat mommy to the bunch. Ecstasy, folks. Wanting to best your parents apparently starts at an early age. 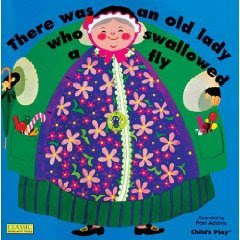 There Was an Old Lady Who Swallowed a Fly is another book from our home library that I remember reading when I was growing up. The song is STILL fun to sing. I wasn't sure what kid would think when the old lady dies after eating the horse but it doesn't seem to have fazed him much. Mostly he's concerned with the fact that I always remember to wiggle and jiggle when she swallows the spider to catch the fly. Silly lady! Silly book! He enjoys it and so do I. If you've never seen this book (I think it's been around for quite some time) it has holes (aka windows) in it which build the picture of her stomach with all of the animals inside of it. This is a unique picture book and he enjoys the pictures as well as the song. Lastly, he's been enjoying playing with some new board books by Tiger Tales in their new Touch Look and Learn Series. Admittedly, these books are beyond him but he likes feeling the raised texture within each of the books. There are two books in the series so far, Colors and Counting . These ARE really cute little books and we've talked about how we should set them aside for future siblings to enjoy, since he already knows how to count to 5 and knows his colors. I AM excited to use them on our next little progeny though because they are great books, sturdy (thankfully) and with bold illustrations that seem to appeal to little eyes. These books were just recently released and are worth checking into. I can rather assure you that your children will be able to enjoy them for years. heh. It seems like this is the month for interactive books! He sure has enjoyed looking for Waldo, feeling and exploring and singing over his books. I've enjoyed it too and am glad he likes to read with mommy. Fun stuff! So what did your kids read this month? I'm looking forward to popping around to your places to "check in" and see what books have been off your bookshelves and into your hands. See ya 'round! I'm glad that all of my gushing about this carnival has convinced people how awesome it is. Finding things must be "his thing." That's really great if he can find Waldo. I remembering getting one for Amanda when she was older than that, and she still couldn't find him. Hmmm, I didn't realize that you didn't use your son's name. Maybe the Little Reader (that's sort of long, eh? but could be abbreviated to LR). 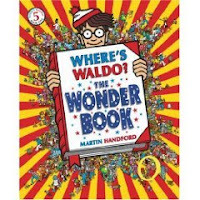 My son (who is 6) loves Waldo books, actually any of those seek-and-find books will do. He also LOVES There was an old lady who swallowed a fly as well as the holiday books along that theme, i.e, There Was an Old Lady Who Swallowed a Pie. Hilarious! I liked where is Waldo. My post us up. I love that there are no boundaries too. I remember the Where's Waldo books, I wounder if my son would like them. He loves the I Spy books. I use my kid's initials in blog posts. I may start using their real names because I have a hard time remembering. Oh, we have that Old Lady book, too! My almost 3 year old loves it as well. The illustrations are so colorful and bright, and she just loves to sing, so it's the perfect book for her. I use nicknames for my kids Pudge is our very chubby baby, Red has red hair, and JAM just gets the lame initials treatment. :) Good luck making a choice! My 5 yo loves Waldo - he now has a book that was mine when I was a kid and he loves to sit and look for Waldo. He also loves looking at what else is going on in the pictures, and sometimes forgets all about Waldo! I use my kids' names in my blog, just easier for me to remember and too many places to change it this late in the game. Yes, we all love comments! I hadn't thought about the Waldo book for little ones, but that is a great idea! My niece had a few Where's Waldo books when she was 1 or 2 and she could find Waldo so fast it wasn't even funny!